Sfinge and zeppola from La Guli Bakery. Before I moved to Astoria, I had never heard of sfinge, that strange looking word that is something crazy delicious. Sfinge or zeppola (zeppoli in the plural) are sweet treats traditionally enjoyed on St. Joseph’s Day, which is today. St. Joseph was the stepfather of Jesus, husband to Mary, member of the holy family. St. Joseph’s Day is celebrated in the western church each year on March 19. 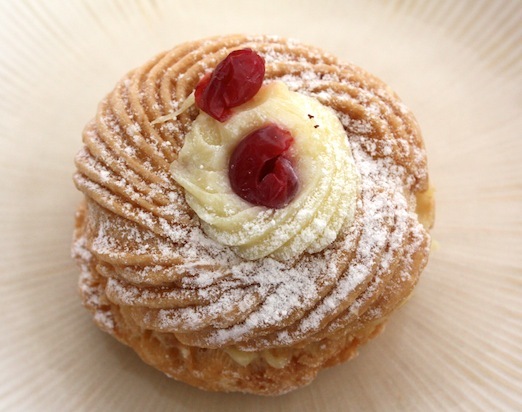 Sfinge and zeppoli are eaten in southern Italy and in Italian American communities, and since Astoria has its own Italian community, they are popular here—in fact, you can get these pastries all year long, but it feels more special to eat them around this time of year. 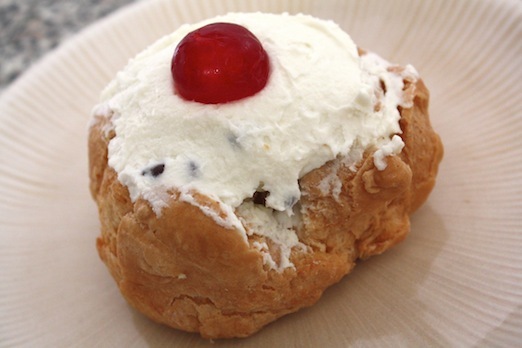 Basically the pastry consists of a cream puff (made with choux paste) and is filled with either custard or cannoli cream. Many sources indicate that sfinge and zeppoli are one in the same but here in Astoria they seem to be treated differently. The zeppola tends to be more or less round and sandwich in the custard, whereas the sfinge is more open and has the cannoli cream placed atop the pastry itself. 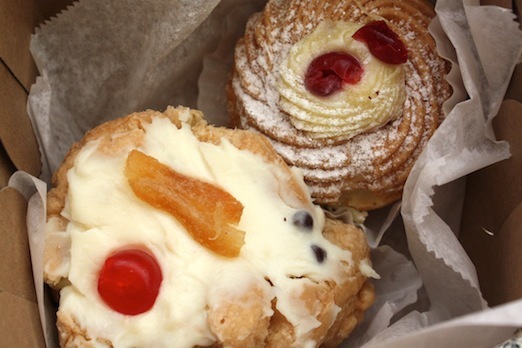 Here in the Ditmars area, there are two places that make excellent sfinge and zeppoli. First is La Guli Bakery, home to amazing Sicilian sweets. 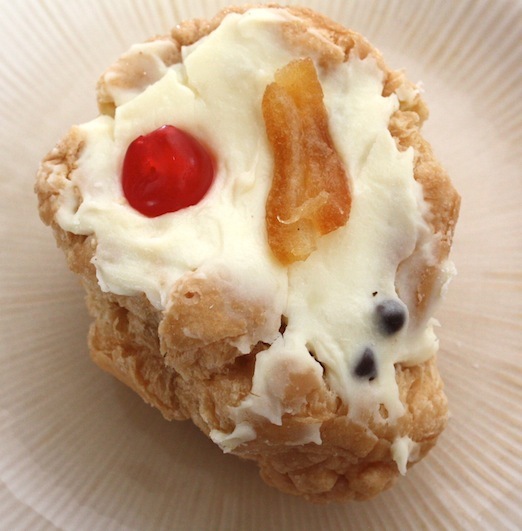 Their zeppoli are made with a light and somewhat crisp, round cream puff, filled with custard and cherries. The custard is also quite light, and the cherries are tastier than your average maraschino cherry. I love the ridges on the top part of the cream puff. 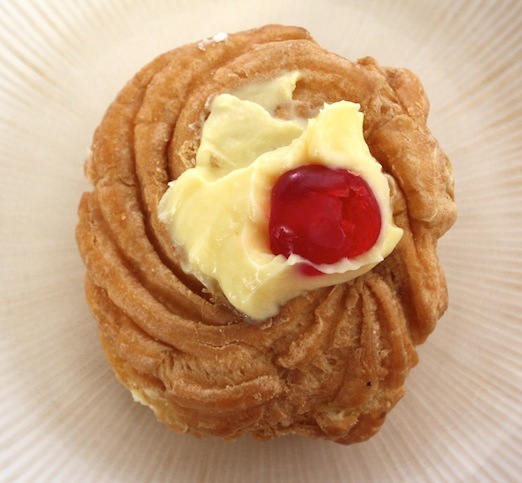 A zeppola from La Guli Bakery. Their sfinge go the extra mile with the addition of preserved citrus rind and a candied cherry. The cannoli cream is sweet and delicious with the little chocolate chips and a pleasantly thick texture. I like the more free form shape of the cream puff, too. Singe from La Guli Bakery. 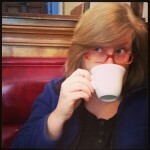 The second place I like to get St. Joseph pastries is Rose and Joe’s Bakery. They have display pastries up front and they’ll get you fresh ones in the back. I found this cream puff to be a little softer than the custard filled pastry from La Guli, but that’s not a bad thing. Overall, the effect was more rustic, with a slightly heavier custard, too. It was delicious. Custard filled sfinge from Rose and Joe’s Bakery. The other version they make contains cannoli cream with little chocolate chips. Compared to La Guli’s version, this filling is a little less sweet and the flavor of the ricotta cheese is evident. Of the four pastries, this was my favorite; I find that I prefer the pastries filled with ricotta cheese over the custard filled ones, too. Most Italian bakeries in the neighborhood should sell these pastries, especially this time of year. We also hear good things about the sfinge and zeppoli at Parisi Bakery and Gian Piero Bakery. So treat yourself today to one of these great pastries, the zeppoli and sfinge! all of my grandparents were from messina sicily. have to agree, sfinge are not the same as zeppole. we make sfinge with a slightly wet batter (recipe is a family secret LOL), and using a large spoon, place a spoonful, one at a time into the hot oil. (you can add white raisin too if you like.) they cook quickly, once done place into a bowl, light sprinkle of sugar! eat while they’re are still warm. there is nothing else like these. we make bowls of them early in the morning, and send them around to the neighbors. quite a treat!!! Where do you live? We plan on moving next door in order to get on your neighborhood pastry route.